I never tire of hearing the incredible acts of the Incarnational God with his work on the cross and the new life of the resurrection with the physical appearances of Jesus. Every year as I reflect on these events, I learn more and more about the love of God for us in Jesus. It was good to be at Holy Cross for Holy Week. 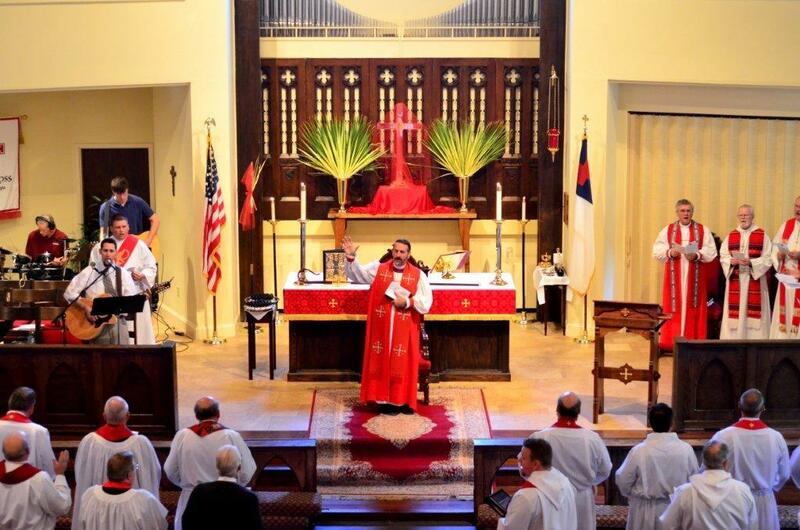 We began Holy Week with Palm Sunday. My sermon for that day, Contemplating the Mighty Acts of God, can be heard at http://www.holycrosspodcasts.org/C1-media;show,80. From the Holy Cross website, you can hear some great sermons from the other pastors who preached the different services all week. We had some GREAT preaching. My Easter sermon entitled, God Loves You, can be heard at http://www.holycrosspodcasts.org/C1-media;show,86. It was also so refreshing to see our members serve all week so that people coming to worship would be welcomed, encouraged, helped, prayed for, and well-fed. The believers in Jesus at Holy Cross never cease to amaze me!! O God, Creator of Heaven and Earth: Grant that, as the crucified body of your dear Son was laid in the tomb and rested on this holy Sabbath, so may we await with him the coming of the third day, and rise with him to newness of life, who now lives and reigns with you and Holy Spirit, One God, for ever and ever. Amen. Are We Headed the Way of Rome? For the first time in modern U.S, history, the United States Government is paying out more money, in cash, to citizens, than it is taking in taxes. The U.S. spent $2.3 trillion on specific benefits to citizens last year, while the government's total income was only $2.2 trillion. Roughly 60% of all Americans now receive some significant financial benefit from the government. Less than 50% of all people pay any federal income taxes. And roughly 10% of all taxpayers (those called the rich) foot virtually all the significant income taxes levied. For the first time in U.S. history our National Debt (over $14 Trillion) is more than the GDP (total economic production) and our National budget talk continues to have enormous deficits. The answers we hear from our politicians are: tax the rich more (as if they have a lot more to tax!) or cut the budget (which means cutting government jobs and/or government payouts causing violent protests from those affected!). The following quote is attributed to Marcus Cicero, Roman Senator, The budget should be balanced, the treasury should be refilled, public debt should be reduced, the arrogance of officialdom should be tempered and controlled, assistance to foreign lands should be curtailed lest Rome become bankrupt, the mobs should be forced to work and not depend on government for subsistence. Not sure if he actually said it, but Rome paid no attention. How about this from Alexander Tytler: "A democracy will continue to exist up until the time that voters discover that they can vote themselves generous gifts from the public treasury. From that moment on, the majority always votes for the candidates who promise the most benefits from the public treasury, with the result that every democracy will finally collapse due to loose fiscal policy, which is always followed by a dictatorship." If you believe in the power of prayer, it is time to get serious about interceding for our country, our leaders, our fellow citizens, and our churches. It is my opinion that unless God intervenes in a miraculous, supernatural way, we will fall into an abyss like the U.S. has never known. Pray. Pray. Pray. Ask God to help us, even in our ignorant and unrepentant state. Ask Him to send revival and spiritual renewal. Like on Good Friday when all seemed hopeless, Sunday came and God changed everything. Let's ask him to do it again. I could never myself believe in God, if it were not for the cross. The only God I believe in is the One Nietzsche ridiculed as "God on the cross." In the real world of pain, how could one worship a God who was immune to it. I have entered many Buddhist temples in different Asian countries and stood respectfully before the statue of Buddha, his legs crossed, arms folded, eyes closed, the ghost of a smile playing round his mouth, a remote look on his face, detached from the agonies of the world. But each time after a while I have to turn away. And in imagination I have turned instead to that lonely, twisted, tortured figure on the cross, nails through the hands and feet, back lacerated, limbs wrenched, brow bleeding from thorn-pricks, mouth dry and intolerably thirsty, plunged in God-forsaken darkness. That is the God for me! He laid aside his immunity to pain. He entered our world of flesh and blood, tears and death. He suffered for us. Our sufferings become more manageable in the light of his. 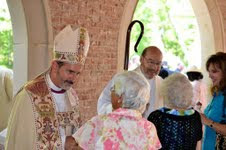 It has been a long-standing tradition in many Christian churches that the clergy gather with their bishop during Holy Week and renew the vows and promises they made to God when they were ordained. Most often, this occurs on Maundy Thursday, but we chose to hold this sacred time on Tuesday because of the distances many clergy have to travel. We had a delightful and Spirit-empowering day!! Since the Anglican Diocese of the South is a new creation within the past year, this was our first time to do this. 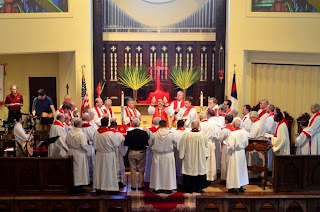 For many of our presbyters and deacons, it was the first time or first time in a long time since the recent Anglican dispersia. What a great day it was! 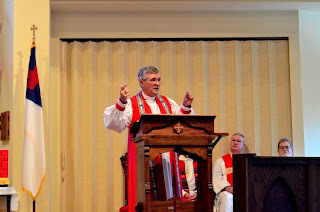 Bishop David Anderson preached encouraging the clergy to walk in faith and obedience; apply our faith in practical ways; serve under the godly authority and moment-by-moment leadership of Jesus; and to go deep with Jesus by continually talking to him. The Rev. Russell Buchard led a seminar on "Understanding the Baptism of the Holy Spirit," and The Rev. Canon Phil Ashey led a seminar on "Clergy Self-Care." Both were well attended. Lastly, the people of Holy Cross served lunch and provided warm hospitality to all who came. Colton Burpo, who was almost four years old, survived an emergency appendectomy in a miraculous way. His father, a pastor, and his mother were overjoyed and relieved that their son lived and that they could take him home. What they did not expect was Colton's story which unfolded gradually in the months afterwards. In a way which only a child could do, Colton describes leaving his body during the surgery and going to heaven and sitting in Jesus' lap. What began to shock and bewilder and inspire his parents was Colton describing events of which there was no way he could have known, i.e. ; what his parents were doing in different parts of the hospital during his surgery -- they didn't even know what the other was doing and saying -- but Colton saw it and heard Jesus' response. Amazing events, but true events. Hold on for a great read, an inspiring story, and one which will get you excited about heaven -- the Biblical Heaven -- and the Lord of Heaven and His Father. Heaven is For Real, A Little Boy's Astounding Story of His Trip to Heaven and Back by the Reverend Todd Burpo. This past Sunday, April 10th, I visited St. Patrick's, Smyrna, TN, where Fr. Ray Kasch, SSC, is the Rector. St. Patrick's is an alive congregation with a big vision. Their motto, "An Ancient Faith for Modern Times" is quite evident. The High Church liturgy and worship was awesome and the Spirit strong. I am very grateful for the warm and encouraging welcome the people gave to Allison and me. 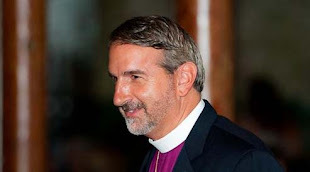 I was reminded of how special and unique this movement of God with and in the Anglican world is. What a blessing to be a part of what God is doing in our world!!! With Fr. Ray Kasch (left) and Father B.E. Spring Break with my wife (a teacher)! We went swimming with the dolphins. God's creation is so incredible. I am always in awe of his beauty. The dolphins were tremendous. Smart. Strong. Quick and fast. Very soft to the touch. And gentle. Allison enjoying riding the dolphin as swims on her back. 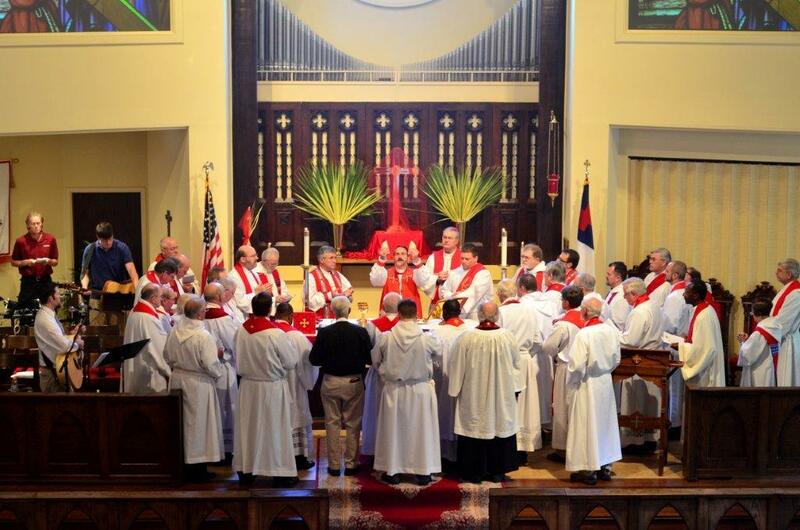 What a privilege to visit Christ the King, Winchester, TN on Sunday to Celebrate, Preach, and Confirm!! It seems that every time I visit a church lately, I am reminded of the incredible sacrifice people have made in order to walk away from a life-time membership to stand on Biblical principles and start a new congregation. How refreshing!! How inspiring!! This parish is on its way to being a tremendous Light for Christ in their part of Tennessee.